NutraLife Meno-Life Hot Flush Relief is a natural remedy for treating hot flushes, one of the most common symptoms of menopause. Based on isoflavones, obtained from soy, clinically tested for their efficiency in treating such side effects, and traditional remedies for treating menopause, this supplement is advertised by its manufacturer as being able to help women achieve the much needed relief from the uncomfortable flushes they can experience throughout the day or night. Here is some more information on the product that may help you. What Does NutraLife Meno-Life Hot Flush Relief Contain? While the presence of isoflavones and herbal extracts is a good thing, we notice that many of the most important compounds are missing. For instance, this product does not have black cohosh, or ammonium succinate, two of the most efficient remedies for alleviating the symptoms of menopause. The recommended dosage is one pill with breakfast. In case you feel like you need an extra pill, you can take one in the evening, as well. 30 tablets cost 33.94USD. Seeing that you may take two daily, this is a bit on the expensive side. We did not see a clear money back guarantee posted on the official website, and you may have to rely on resellers for any issues. 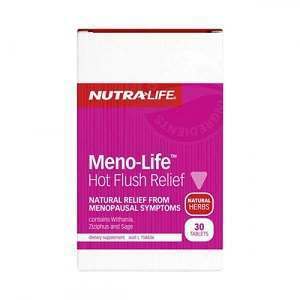 NutraLife Meno-Life Hot Flush Relief is a herbal supplement that is directed at alleviating the symptoms of menopause, especially hot flushes. However, women often experience multiple unpleasant effects of menopause, and they need more support. For them, there are plenty of other products they can try. Jackie Horowitz	reviewed NutraLife	on July 7th	 and gave it a rating of 2.